Last night, after dinner, I admitted that I had put off my training run all day. I had gotten caught up in fun summer activities with my 10 year old and her friend. So, instead of putting on my pajamas and sitting on the couch with my husband for an episode of Orange Is The New Black, I had to put on my running clothes and get out there. The positives: it was a nice, cool night. There’s a beautiful lake nearby. I would be inspired by everyone else who would inevitably also be out there running. The negatives: RUNNING. I’m not a natural runner. Even at my most fit, as a high school athlete, I hated running. I do it now because it keeps me challenged. I love that even after months of not running, I can revisit it anytime I want. It’s free. It’s empowering. I’m never alone out there. 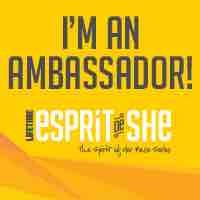 Three years ago I heard about a new race series called Esprit De She. It’s a series just for women and it’s open to ALL women, runners, joggers, sloggers and walkers alike. I say that I run but really it’s a mix between jogging and slogging. It’s not pretty and it’s not fast. Anyway, I became a “founding finisher” of the two races in my area that summer, and I haven’t missed one since. In fact, this year they made me an Ambassador because of my enthusiasm for this race. I would be lying if I didn’t admit that a good portion of my enthusiasm comes from the free wine and dinner provided after each race. You get two free glasses of wine and a keepsake glass after each race! Also there is so much swag it’s insane. I love all the samples. I love the cute tank I get every year. I’m serious, but also I really love that it’s such an empowering event for women. I see ladies of all ages, shapes, sizes and ability out there, and they are all proud of their accomplishments. They are smiling and hugging and high-fiving each other. It gives me all the feelings. 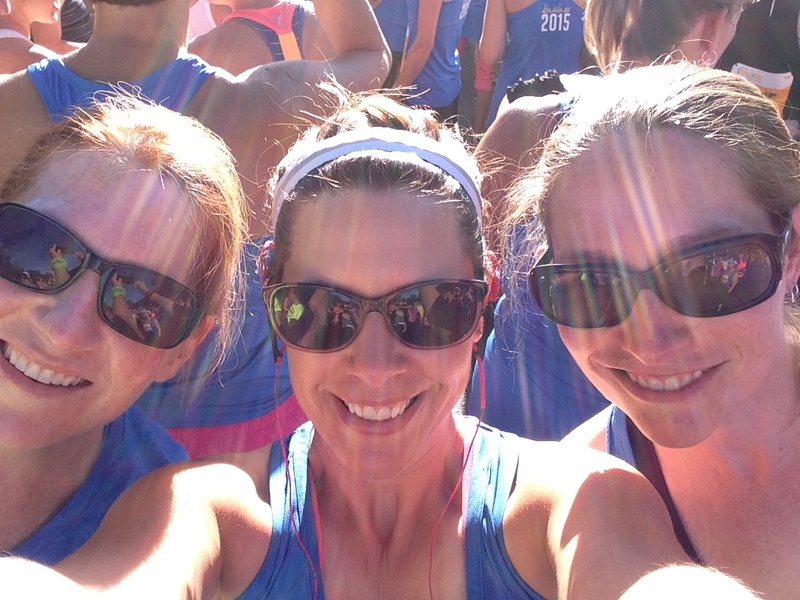 I’ve made brand new running friends at the Esprit de She events, and I’ve brought along lots of good pals too. One of these ladies is a good friend and one is a brand new one! Yay for friends. 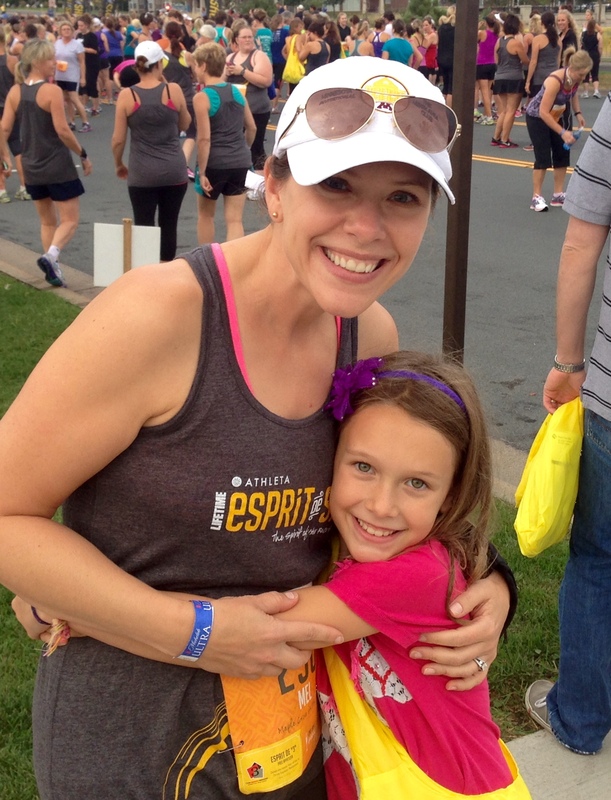 I love that I’m showing my 10 year old daughter that I care about staying healthy, engaged in the community, and that friendships are important. 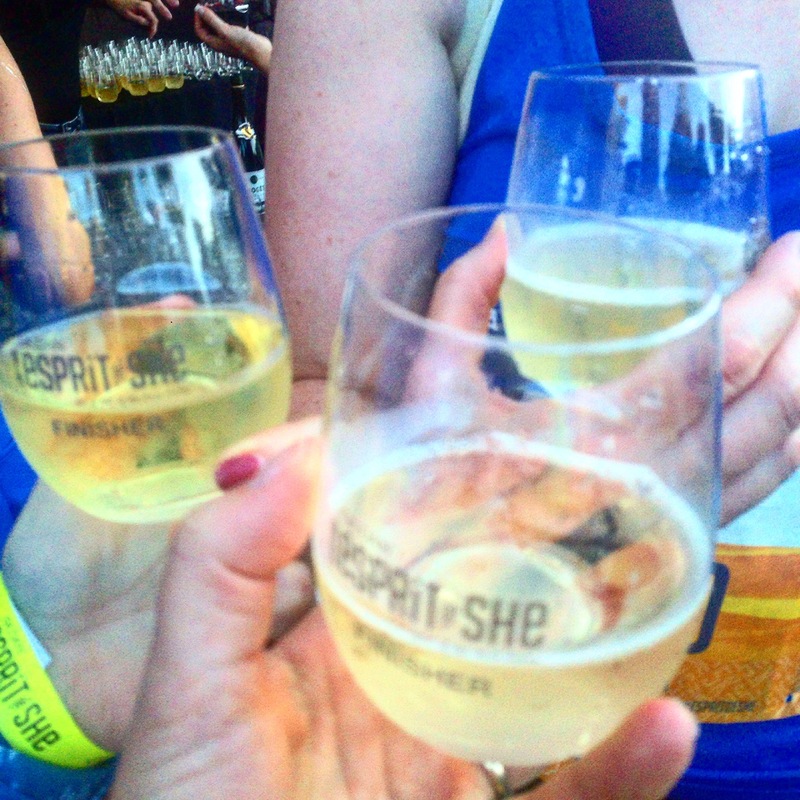 Esprit de She events are held all over the country. And they really are so much fun. Click on the link if you want to find one near you. If you want a discount of 10% you can enter my code which is EDS074. If you haven’t run or it’s been a long time and you need some structure and a training schedule, I really like Hal Higdon’s plans. They are easy to follow and will help you stay motivated. If you are in the Twin Cities area, please let me know that you are registered and we will meet up and start together! And have a glass of wine after! There is a Maple Grove race on September 17! Whatever you choose to do, I guess I would just like to say GET OUT THERE. STAY ACTIVE. FIND SOMETHING YOU LOVE. MAKE TIME FOR IT. As someone once said to me, “You don’t have to exercise, you get to exercise”. And they were right. I look forward to meeting you at MG! I really hope all the ambassadors can get together to take a picture. 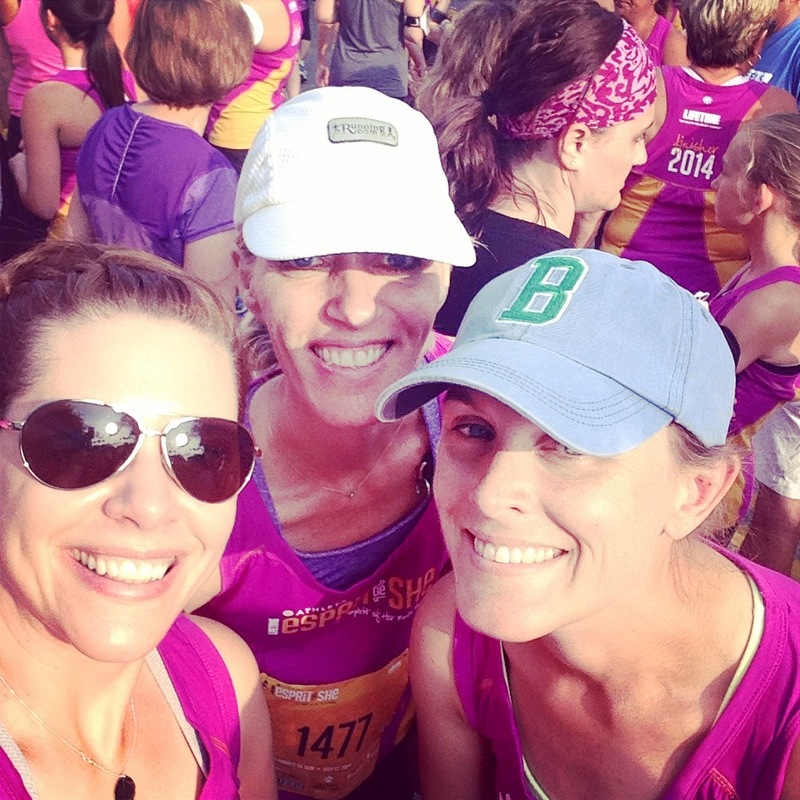 We have tried at the other two Twin Cities races and it hasn’t happened, but let’s hope third time is a charm! Let’s do it! We’ll just have to set a time and place, before the race probably best! Hope to see you there! Maybe all the ambassadors should start together? It would be fun if they had that as part of the race series, where they introduce the ambassadors and have us lead it off? Esprit de She is awesome. The Chicago swag was EVEN BETTER this year. We had to walk home (instead of run) b/c we had so much! Love the end of your post. We GET to run! I always try to remember that! The 50th and France in Minnesota swag was crazy this year too, compared to the already good stuff we got last year. Can’t wait to do Maple Grove in September! Whatever gets you out there. Just get out there and do it.